A few weekends ago I went out to play and went to Colchester Mills Fabrics -- a wonderful quilting and more shop in Colchester, CT. The selection of fabrics is just WONDERFUL! I'm really not a sewer -- I'm a stitcher. But I occasionally need fabrics for finishing or for other small items I make. Sometimes I see "pretties" and just have to get them! Many times I have no idea at the moment what I might do with them...but they almost always become something later. On this trip I found these fat quarters and they were just so pretty together I had to get them all! And then I saw some gorgeous thread, a pack of buttons, and these scissors! I was unable to resist them, have no idea what I'll do with them right now...but they are there when I want them! LOL! 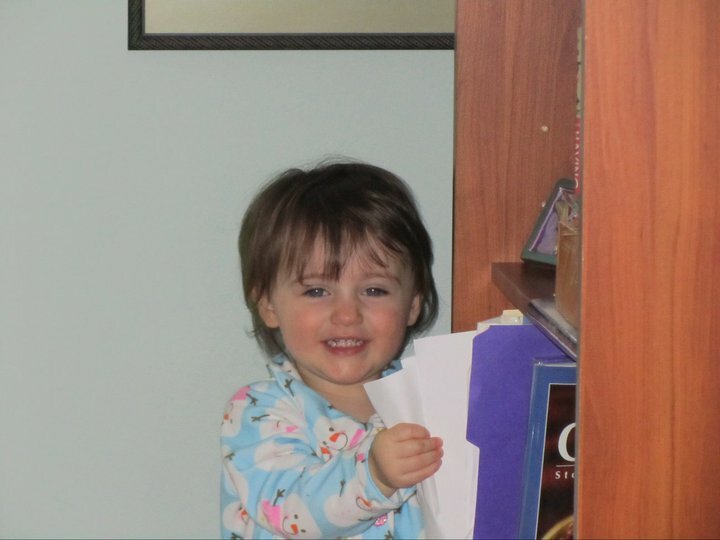 Some of you have seen my very adorable great niece Mckenzie. 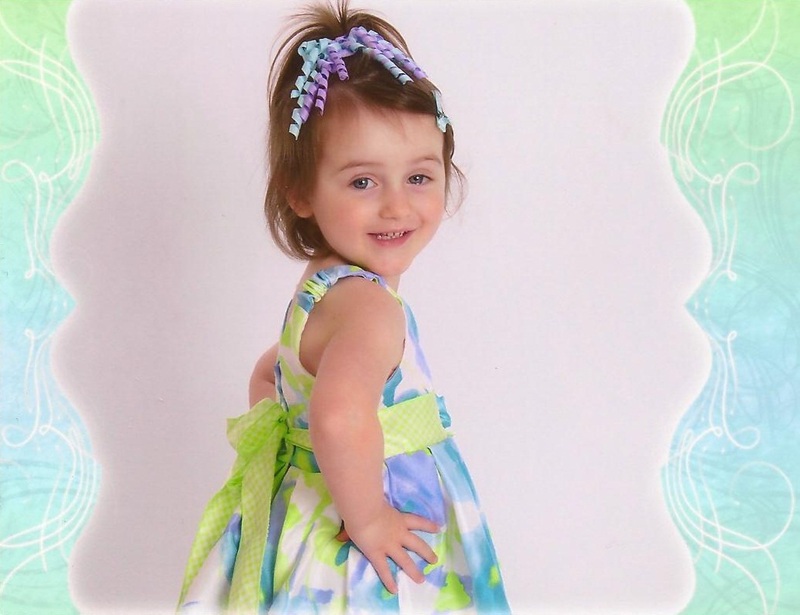 That little bundle of sweetness is now 2-1/2 years old. Here's her Easter picture. Can she possible get any cuter?!? I've been very busy working on plans for this years Stitcher's Hideaway retreats -- and the ones to come in 2013. A lot of work goes on behind the scenes to create these fun events. Each one has been quite different from the other, and continues to be so. I've now run 32 retreats and this October will mark the 10th Anniversary of Stitcher's Hideaway! What wonderful stitchers I have met through the retreats -- so fun and talented! Many have become very dear friends to me. 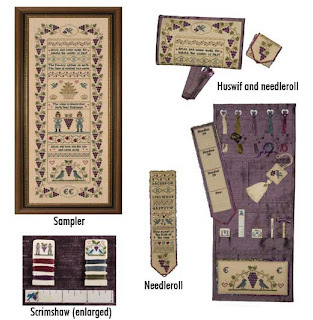 On July 5-6, 2012, Ellen Chester of With My Needle will be teaching her Fruit of the Vine design, which can be made as either a sampler or a huswif. She'll be teaching at the Publick House in Sturbridge, MA. Several attendees are arriving early to celebrate Independence Day at Old Sturbridge Village. During the retreat, there will be a presentation on Celebrating Patriotism by Old Sturbridge Village staff members Jean Contino, Coordinator of Households, and Rebecca Beall, Collections Manager. The presentation will include a look at excerpts from letters and diaries describing 19th century celebrations such as Independence Day, and a variety of objects from the Old Sturbridge Village collection such as needlework pictures with patriotic motifs, embroidered memorials to George Washington, dress clothing which might have been worn for festive celebrations, and an assortment of household objects bearing patriotic imagery. This will be a wonderful addition to the retreat! If you haven't signed up yet, visit the Sturbridge Retreat for all the details! My husband and father and I are looking forward to this event so very much! We hope to take in the fireworks at Old Sturbridge Village on July 3rd, and then spend time there on July 4th. If you haven't yet been to Old Sturbridge Village, I recommend it! It's a recreated village, circa 1860, that one can walk about and enjoy at leisure. It's relaxing, enjoyable, and educational. There is also a gift shop on the premises with a fantastic book section. I always get lost in there! I have found a delicious way to prepare Asparagus! We had it last night for the first time and LOVED it. With asparagus at a good price in our area at the moment, we'll be having it a few more times this season. Cover the asparagus spears and garlic with the olive oil (I used my hands). Lay the asparagus on a cooking sheet that has been sprayed with non-stick spray. Roast in a 400 degree oven for 8-10 minutes until crisp tender. P.S. Just found out there are some asparagus recipes on Food for Friday! Wow! I have big time neglected my blog! But there is a reason. I managed to injure my neck, shoulder and arm and for several months now I've had to limit using them only for necessities. This has, unfortunately, meant no stitching for me. How heinous is that!!! But I've been having stitching-related fun in the meantime, and will be attempting to stitch a bit very soon. I ran the March 2-3, 2012 Stitcher's Hideaway Alumni Winter Escape Retreat and it was a blast! I spent my time hanging out with everyone and admiring everything they were working on. What a talented group of women! There were 36 of us so there was a lot to see. We had so much Show 'n Tell that we did it over 2 days. You can read about it on the Fun Report. 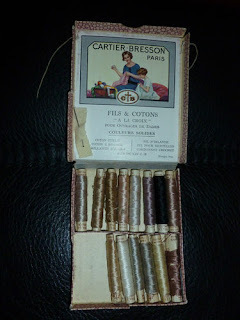 During this non-stitching time, I've been visiting antique shops and picking up cool stitching-related items. Here are some of my cool finds. This is labeled Cartier Bresson Paris. Necessaire Miniature, pour repriser et remailler. The threads are very soft cottons. These were fun finds, from 2 different places. The silk measuring tape is marked OA&S, which I discovered was Olney Amsden & Son, a wholesaler in London that was in operation from 1904-1991. The needles and threaders I picked up to go into some cool etuis I've made over the years. The other item has green glass head pins, is about 1" high, and is labeled: Crowley's, Spring Steel, Needle Shanks, "Berry" Pins, Made in England. I hadn't yet heard of "Berry" Pins or of Crowley's. It's pretty cool looking. There have been other finds, as well. I found some cool silk tassels, a jar of all white antique buttons, and some fabric. None of these items were expensive, but I took great pleasure in finding them and wondering about them. A few months ago my elderly neighbor Mary Ann passed away at the age of 93. I enjoyed visiting with her. 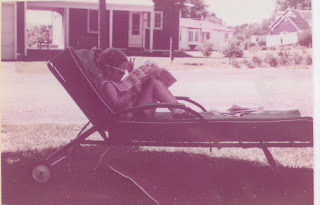 She liked to sit out on her front porch whenever possible and keep watch over the neighborhood. I'd go over on a hot summer day and we'd just hang out and chat. Some days we went into her house, which was quite a sight to behold!! Mary Ann was a collector of pretties -- costume jewelry, dolls, and loads of china. There was no room left in cupboards or shelves for all her pretty china, so it was literally piled up in stacks on the floor of her dining room, which she never used except to stack up all her pretties. When she died her family had no idea what to do with all her many belongings, so after taking what they wanted they had a big estate sale. My husband Michael and I wanted something to remember her by so we each chose a funny and unusual item, which reflected Mary Ann's great sense of humor. Mine was a painted ceramic piggy bank. Michael's was a candle holder -- the candle part sits on top of a large leaf that is being oared by a mouse through imaginary water! There was a HUGE pile of costume jewelry. Among them was an item marked just $3 that immediately caught my eye. I didn't even open it there because I didn't want to draw attention to it. Someone didn't know what they had. Michael caught my eye and he knew I had found a treasure. It is the brass sewing kit (circa 1930) picture below. I was THRILLED to spot it and tickled to know that Mary Ann had once owned and used it! As we walked out of the estate sale, I said to Michael as I tightly held the sewing kit, "My precious...."
But that wasn't all I found -- hehehehehe. There was a little plastic baggy filled with a bunch of plastic naked ladies!!! LOL!!! This cracked me up! What on earth did Mary Ann have them for? Ha!! They were probably once used for serving food or maybe drinks. They are each about 3" long. I purchased those, too, knowing I'd figure out something to do with them -- and sure enough! I gave them out at the Alumni Winter Escape Retreat as thread winders!! Bwah-ha-ha-ha-ha-ha-ha!! Oh, how Mary Ann would be laughing hysterically over that!!! Here's a picture I took of some naked ladies at the retreat. Until next time, my friends, my best to each of you and may your stitches always lay perfectly! Shortly before Thanksgiving I went to a great church fair and found something wonderful! They had a room filled with old linens of all sorts. Many were handmade items with elaborate needlework on them. They were selling for so little. As I went through hundreds of items I kept wondering who made them and how on earth did they end up in this sale? Did the creator pass on and did family members not understand or appreciate what was made? Or were there just no family members left? I'll never know the answer, but let me show you one of the incredible finds. It is a gorgeous tablecoth with cross stitch, backstitch, lazy daisies, and appliqué. Every stitch is perfect and the appliqué placement is beautiful and consistent. It also came with 16 matching napkins! There are no stains or imperfections. The whole set cost me $6 and I used it on Thanksgiving Day! It was fun! But if I ever do it again, I'll get more people to help me decorate them so that it won't take quite so long. I think they came out pretty cute -- and I can tell you that they are yummy because Jen and I "had" to eat one when it broke in half (hehehehe). 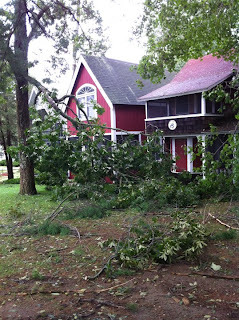 So I should give an update on our Tropical Storm Irene damage. Once the power cables were fixed, the tree was removed revealing damage to our house. A branch has pierced our roof and shot out the other side. There is some other small damage -- bent gutters and siding, and miscellaneous damage to the roof. It's pretty disappointing since our roof is brand new. Some folks were out today looking it all over. The house was built in 1956 and the siding is no longer made. They are batting ideas around as to how to fix it. They are going to try and find some of the siding somewhere and will get back to us next week. Meanwhile, my house has a very visible boo-boo. Well, time to go turn those cute little cookies into favors for the Tea tomorrow! It's going to be fun! Tropical Storm Irene blows through! Well, we made it through what became Tropical Storm Irene in central Connecticut. We're okay, but we have a mess to deal with. Dad, Michael and I were all looking out a picture window when we saw a sudden downward gust of wind slam down a huge pine branch in front of our house. It is resting on power lines and so there is nothing we can do about removing it until CL&P gets out here. We never lost our power, but they will have to turn the power off to take care of this problem. CL&P obviously has more urgent work to do so we're guessing it could be a couple weeks until they are able to help us. Our backyard is so full of tree debris it's crazy. Dad is in his own little world of happiness because he has loads of yardwork to do. He lives for that! Our cottage at Camp Bethel is also safe, as are all the other buildings there. However, they lost power early on in the storm and are not expected to get it back in that area for at least a week. There are many downed trees. Here's a picture of a tree branch that fell in front of our cottage. Our cottage is the one on the right. Some friends took the picture of us, and removed the branch from the area, too! We haven't gone there ourselves yet as we have enough to deal with on the home front. My brother Lee is involved with emergency services in Lyme, CT, which is near the shoreline. He sent me a text message today letting me know that many houses were damaged, and about 7 were totally lost. One person died. Trees are down and almost the whole area is without power. A helicopter dropped food and water to them. The emergency personnel are working around the clock and taking rest in shifts. Sounds like it has been tough there. It is a relief that the hurricane was downgraded to a tropical storm by the time it reached us. Things could have been so much worse. Here's some videos I took of the storm as it came through our area. Here's the new view out our bedroom. And now...well, I'm sick of Irene. Sick of preparing for her arrival, dealing with her trashing our house, and dealing with picking up after her. So to cheer myself up, I'm going to look at some cute videos of my great niece Mckenzie! 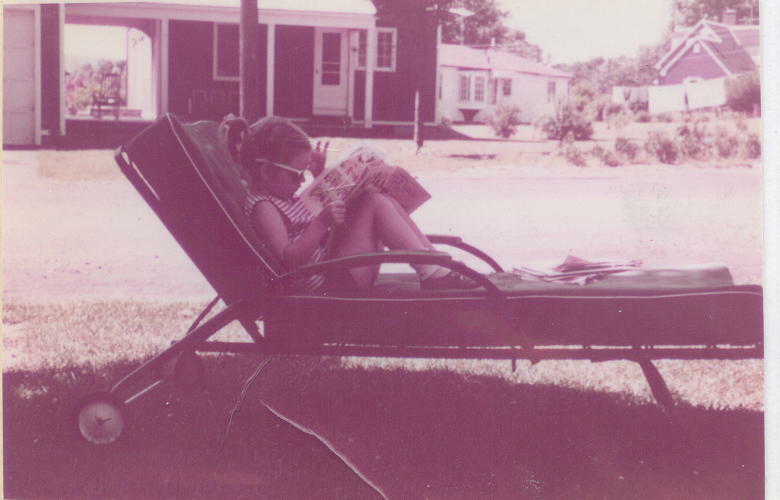 Here she was on her grandparent's proch, which overlooks the Connecticut River. Mckenzie called it "BIG water" and her little pool "baby water." And here's one from a whole year ago that stills make me crack up!! LOL! Now I feel much better! Finally! A few moments to update my blog! Getting ready for the Sturbridge Stitcher's Hideaway (July) consumed a great deal of time -- and then there's taking care of dear ol' Dad. "SEE YOU IN THE MORNING!" We live close to a cemetery, and I'm pretty sure he just woke up some of the dead. Dad's all excited about tomorrow, because we are leaving for 10 days at our cottage at Camp Bethel, which is holding its annual Camp Meeting. Camp Bethel is an interdenominational Christian camp ground. My Dad has been going there since he was a baby. He met my Mom there. In fact, their families knew each other from attending Camp Meeting (Mom's family was from FL, Dad's from CT). When my Mom was born, she was given my father's mother's name, Iva June. Who knew she'd end up marrying into that family! So, for awhile, there were two women named Iva June Watkins. So anyway, Dad has short-term memory loss. He knows Camp Meeting is coming up and he's quite excited about going. However, he can't keep straight what day/time we are leaving and has asked me probably 10 times today about it. Unfortunately, we won't be able to leav for Camp until mid-afternoon, so he'll probably ask me 10 more times tomorrow. LOL! Here's a pic of Dad taken a couple months ago. He was clearing leaves and branches out of a miniature golf course at Camp Bethel. I swear, he puts most younger men to shame! I've managed to get in some stitching. I made this for my buddy Deb, who has a thing for bees. It's a Prairie Schooler design, now OOP. And then I recently stitched "Summer Garden" by Thea Dueck of Victoria Sampler. I LOVE this. I also designed a freebie for the attendees at the Sturbridge Stitcher's Hideaway, which I named Hear the Sea Call. It's a simple piece, but what's cool is that little shells and sea glass and fish carved from shells embellish it. 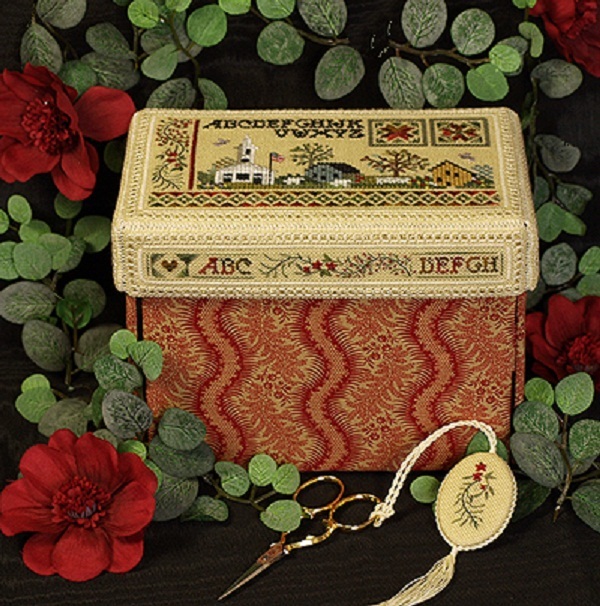 Thea Dueck was the instructor for that retreat and she designed the Sturbridge Sewing Box as our project. It is SO way more gorgeous in person. The linen, silk threads, and lining fabric were such an awesome match. This piece is really going to be a treasure! I'm bringing the kit to Camp in hopes of getting much of it stitched there. The kit came with a DVD with all the instructions for completing the project, including the finishing! Woo-hoo! My little great niece Mckenzie is the delight of our family. She's just adorable, sweet and so fun! She calls me Auntie Sue, and whenever she says it, my heart melts! She loved the air escaping from the balloon! LOL! 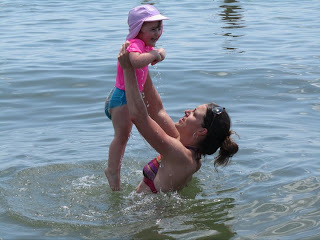 She's been taking swimming lessons and just LOVES the water! She calls the ocean and the Connecticut River "Bigger Water!" and her wading pool is "Baby Water." She turns 2 in another week and we're all ready to party!! My husband arranged for a caregiving-free afternoon for me and so I did one of my favorite things -- I visited some antique shops looking for needlework-related finds. I was very excited to find some pincushions! The largest one has a 5.25 inch diameter. The material is a lovely vintage cotton print, and it has a strap allowing one to carry it or hang it (cost $3). The smaller pincushion is made from wool fabric (cost $2). The scissors are US made, are 3" long, super sharp, and cost me $2! The cotton crocheted pineapple is interesting. There were 13 of them in a little bag for $2. Don't know what I will do with them, but I couldn't leave them behind! I saw so many things in this particular shop, but these are the ones that I couldn't leave behind. Some of the little antique shops in out of the way places are where I discover my little finds. It was really nice to get away for awhile without any responsibilities. Dad had a seizure a few weeks ago and it seems to have impacted his memory and understanding even more. Of course, I am happy to help him during this time in his life when he needs me, but it sure is nice to get a breather now and then. I picked up a yummy veggie wrap at a funky little deli and ate it alongside a stream that was rushing and roaring from all the spring snow melt. So relaxing! So now that I'm home much more, I've been playing around with recipes and it's been fun! I'm always on the lookout for healthy options, especially low-fat and low-carb because of the dietary needs of our household. I also enjoy finding tasty vegetarian options. I then enter the recipe into Spark Recipes, which will calculate the nutritional value per serving. So helpful! So I thought I'd share some of my recipes. Here's one my husband and I call Mexican Pizza. This is not a low-carb option, but if you keep your portion within reason it's fine for a meal and makes a nice vegetarian option. Top Boboli with salsa, then beans, onion, pepper, and lastly the shredded cheese. Bake at 450 for 15-20 minutes. One serving is 1/8 of a pizza. Sometimes I like to saute the peppers and onions in a small amount of olive oil first. I don't always use a boboli either. Sometimes it's pre-made pizza crust, and often it's thin whole wheat pizza crust. What you use for the crust, obviously, changes the nutritional information. It can also change the baking time, too. Follow the directions that come with your pizza dough to make sure you bake it at the right temperature/time. After topping the crust with the salsa, I add the beans, peppers and onions. Last of all I add the cheese. This is a quick meal to throw together, and it's very yummy! We use medium strength salsa, but if you want a bigger kick, go for the hot stuff. This past weekend I visited some of my family and it was so nice! I hadn't seen most of them since Christmas. My niece Lauren was visiting from FL, so that was a special treat. Everyone is doing great, and Dad enjoyed seeing them all so much. Here's the little rascal peeking out after hiding from her parents behind a bookcase. That is one very much-loved little girl! Now I know that Spring is really around the corner! Today was the Hebron Maple Festival held in Hebron, CT. The sap is running from the Maple trees and syrup and other goodies are already being made. Dad and I went and had a fun day just taking in the warmer weather and the festival. Our first stop was to a local church, which held a craft fair. We saw some beautiful items there -- handmade beaded jewelry, colorful scarfs and pocketbooks, hand-blown glass, unique bird houses, and so much more. I purchased a round mirror that had been decorated to capture a bit of the sea. If I can figure out how to take a good picture of it, I'll post it here. My plan is to hang it in the bedroom wall of my cottage. There were some fun food items offered at the festival - maple cotton candy, maple nut ice cream, maple ham sandwiches, etc. Next we visited several antique shops. I love to look at old linens and such. You just never know what you'll find. I picked up two items. I'm not sure exactly how this piece was made. When I first glanced at it I thought it was crochet -- but when I looked closer at it I thought it was woven with surface work added. Click to see it larger and see what you think the technique might be. It feels like cotton. 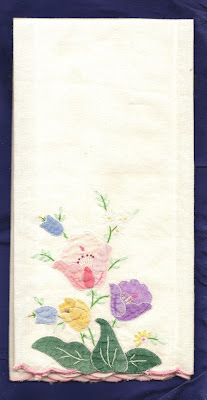 I found this little appliqued hand towel that was just sweet. I'm hanging that one in my bathroom -- a perfect color match. 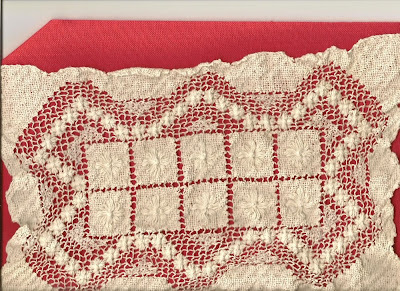 I can't seem to resist little hand towels and hankerchiefs with embroidery and cutwork. They are usually sold very inexpensively - a couple dollars or so. I have a drawer of them and like to just take them out and fondle them all! LOL!! I can't help but wonder who made the pieces I find. I end up paying a few dollars for something that probably took who knows how many hours to make. I wonder who made the pieces and how they ended up in a pile in some antique shop. Afterwards, Dad and I continued our Maple Festival fun by going to a small cafe for a yummy lunch of maple nut waffles with real maple syrup, sausage, and hot coffee. Mmmm. As we waited for our order to arrive, I put my new linen finds on the table and was examining them again when the waitress came over to look at them. Her name is Becky, and as it turns out, she loves cross stitch and embroidery! Becky was also wondering if the piece above was woven rather than crocheted. We were very curious about it! It was a nice surprise to meet another needlework fan at the cafe. It felt so good to get out and about after this looooong winter. After we left the festival, I just wasn't quite ready to go home so we drove to Michael's to pick up a frame for the "Always Kiss Me Good Night" stitching I did for my husband. After I get it stretched and framed I'll post another picture, which should do it better justice. Speaking of pictures, I'm thinking I need to invest in a better camera because so many of the photos I take are blurring up on me. I had to scan the pictures of today's finds in order to post them here. Looks like I need to do some research on cameras! Hallelujah! Spring is on the way!!! Our snow is only about a foot deep now, and in some places we can see patches of ground! What a winter!! It was really starting to get to me. At one point when it was about 4' deep I "planted" some flowers to cheer myself up -- and to entertain my neighbors. It was a very welcome break from my cabin fever to go to the Stitcher's Hideaway Alumni Winter Escape retreat. What a great time we had! It was totally Stitcher's Gone Wild! The conversations and laughter were so wonderful. We stitched, talked, accumulated more stash, laughed, and feasted on catered meals for 2 whole days and nights! Paradise! I'll be writing about our time together to post on the Stitcher's Hideaway website soon. I actually managed to get some stitching done in between being silly and chatting with everyone. I finished up these two "Songs of the Seasons" by Prairie School (sorry, folks -- it's out of print now). I stitched them over one and changed the linen and some of the floss colors. By the way...I found out that you can click on these photos to see them larger. Next I did all the basting for my next project -- "Sweet Pea Gazebo Sampler" by Thea Dueck of Victoria Sampler. I'll be working on that as soon as the weather starts warming up. Why? Because I have SSD (Seasonal Stitching Disorder) and don't like stitching on summery designs in the winter, etc. Weird, I know. Then I worked on "The Bunny Run Around" by Theresa Layman. 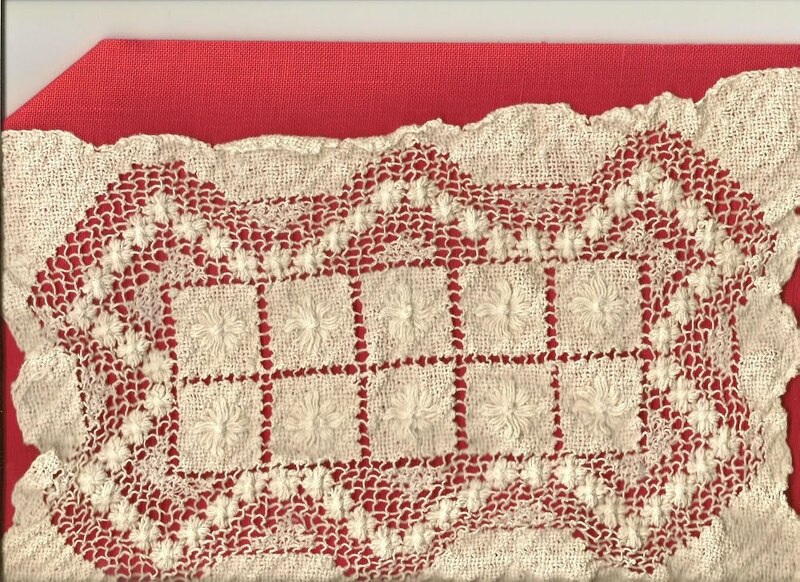 This design is done all in French and Colonial knots on muslin. I have quite a bit of this design done and am now just filling in background color, which made it a great project for me to work on while chatting and laughing with all the other stitchers. The instructions say that there are approximately 1100 knots per square inch. I find it hard to believe -- but that's what it says! So, I'm thinking I'm a pretty sick individual for taking on this design -- but I do love it! I finished up some great projects last year. This one was made for my niece Hilary and her husband Alex Rose. I altered "Good Friends Sampler" by Victoria Sampler to turn this into a wedding sampler. The colors and design were so perfect for them. At some point, now that the winter will soon leave us, we'll be getting together to pick out a frame for it. I also completed another Victoria Sampler design -- "Sturbridge Kitchen Garden" -- which Thea Dueck designed and taught at the Sturbridge Stitcher's Hideaway Retreat in 2009. The design depicts scenes from Old Sturbridge Village. I finished the "Martha Washington Sampler" by Dawn Fisher of Morning Glory Needleworks. Dawn designed this piece for the Sturbridge 2010 Stitcher's Hideaway Retreat. Each band represents something in Martha's life. Dawn was an awesome instructor! She is also a history buff and so she shared a lot about Martha's life with us. It was so interesting and fun! I also finished "Always Kiss Me Good Night" by Dawn Fisher of Morning Glory Needleworks. This was a Christmas present for my husband but I had a difficult time getting it done. I had plans to complete the very last part on Christmas Eve -- but my husband just wouldn't go to sleep so I could work! LOL!! So when I gave it to him on Christmas morning, it only said "Always Kiss Me Good"! I have a WIP I'll be working on during the next few weeks before my SSD kicks in and I switch to the Sweet Pea Gazebo Sampler. It's "The Bay State - Massachusetts" by Jeannette Douglas Designs. She taught this at the Sturbridge Stitcher's Hideaway 2007 retreat and I have it on a frame about 40% done. It's gorgeous. Gee, I hope I can finish it before my SSD hits me! 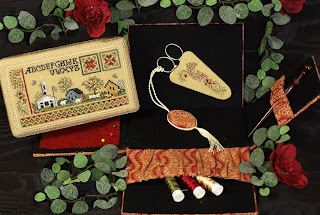 Jeannette will be teaching at the Mystic 2011 Stitcher's Hideaway Retreat -- another new project. Can't wait to see it! One of the many things I enjoy about the retreats is seeing what everyone else has stitched during our Show 'n Tell sessions. I am truly amazed at how awesome we are!! LOL!! At the recent Alumni Winter Escape Retreat there were so many amazing works of art -- many different techniques involved -- and even some knitting and jewelry to see. Some items had been entered into fairs and had received Blue Ribbons and Best of Show! I'm telling you, stitchers are cool!! I became addicted to stitching in 1998 and it soon took over my life! 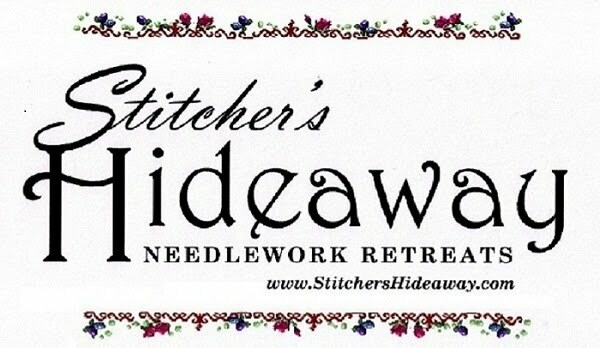 I created Stitcher's Hideaway Needlework Retreats in 2002 to meet other addicts and to feed my addiction! LOL!